Salt, Pepper or Nutmeg ? You decide which of your favorites to spice up your dishes, should reside in the transparent chamber. 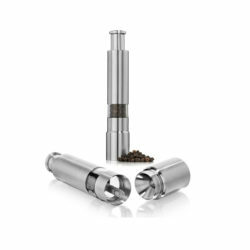 Our grinders, made of stainless steel, fits easily in the palm of your hand, operated only by the press of your thumb. 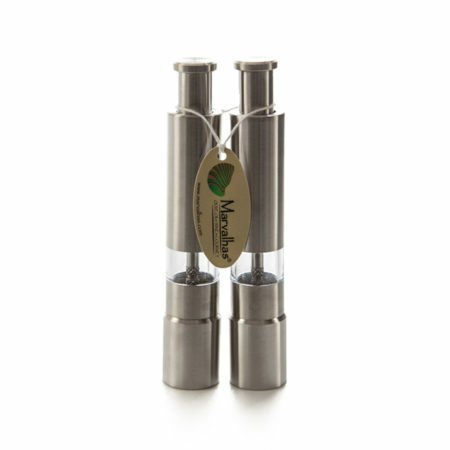 At just about 6 inches tall, these grinders do not take up valuable real estate on your table or counter top. Refill the interior, simply by screwing apart the two bottom steel sections. Either as a set or used singularly, these grinders are a real thumbs up.